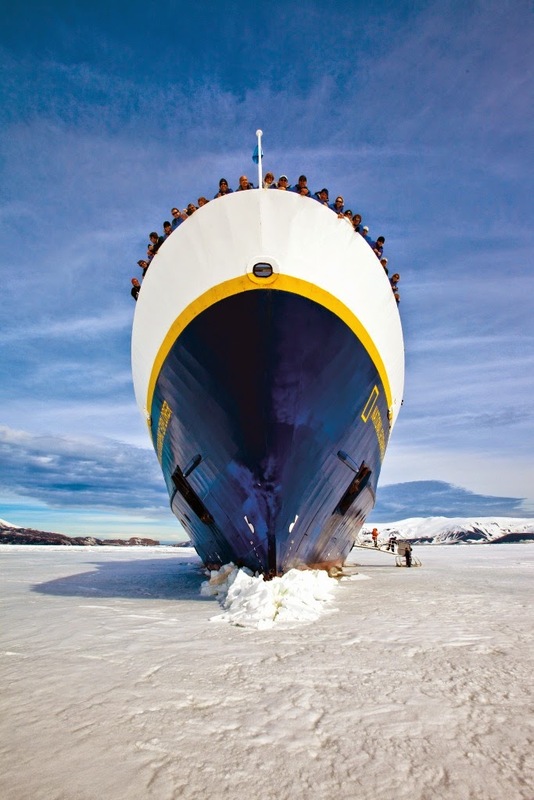 Lindblad Expeditions-National Geographic is bringing to life one of the most storied expeditions in modern history, with exciting enhancements to the 2014/15 voyages to celebrate the Centennial of Sir Ernest Shackleton's Imperial Trans-Antarctic Expedition. Guests aboard National Geographic Explorer and National Geographic Orion on the 2014-2015 voyages to Antarctica will learn about the exploits of Shackleton and his men on their ill-fated attempt to traverse the continent by foot, and the examples of leadership and survival that continue to be taught throughout the world today. As expedition photography is an integral part of Lindblad Expeditions-National Geographic, the season will be dedicated to Shackleton's expedition photographer, Frank Hurley, whose remarkable images have left a stunning record of the ultimate expedition adventure. One of the experts in this field is National Geographic photographer and writer Kim Heacox, the author of Shackleton: The Antarctic Challenge. Lindblad Expeditions-National Geographic and Heacox have created an exclusive onboard Centennial event: an entertaining multi-media presentation that uniquely captures the spirit of Shackleton and the crew that set sail with him on the Endurance in 1914, and that brings Hurley's artistry into focus like never before. Guests will have the chance to take to the ice themselves, hiking, kayaking, and taking Zodiacs into the beauty of the Antarctic alongside naturalists and historians who will recount the saga. A National Geographic photographer is on hand aboard every voyage to offer tips and advice in the field, as guests aim for their own memorable Antarctica shots influenced by some of Hurley's most iconic images. Each guest will receive a custom-designed parka that combines vintage-style expedition wear with high-tech fabrication for maximum comfort, and comes with a Centennial badge designed just for the occasion that will commemorate the once-in-a-lifetime adventure. Lindblad-National Geographic guests will also have the chance to toast Shackleton, Hurley and their fellow explorers with the same whisky favored on the original voyage. In February 2007, the New Zealand Antarctic Heritage Trust uncovered two crates of Mackinlay's Rare Old Highland Malt, remnants of the 25 cases Ernest Shackleton ordered to provision his 1907 Nimrod expedition. Whyte and Mackay have issued a limited release of the whisky, and the ships have been provisioned with the legendary malt. Travellers will start their own learning adventure long before boarding their voyage thanks to Alfred Lansing's acclaimed book Endurance: Shackleton's Incredible Voyage, which will be complimentary to guests prior to departure. All Antarctic voyages throughout the season will feature an array of Lindblad Expeditions-National Geographic 'Global Perspectives Guest Speakers' who will add relevant insight and personal experience to the expedition community. They include Pulitzer Prize-winning author Edward Larson, whose latest book is An Empire of Ice: Scott, Shackelton, and the Heroic Age of Antarctic Science; Jared Diamond, National Geographic Explorer-in-Residence, scientist and Pulitzer Prize-winning author; Kendrick Taylor, Chief Scientist for a project investigating climate change and the Antarctic ice sheet; Joe McConnell, environmental scientist; Fen Montaigne, journalist and author of Fraser's Penguins: A Journey to the Future in Antarctica, and Peter Hillary, of mountaineering royalty, who has summited the highest mountain on each of the seven continents and established a new overland route to the South Pole. Journey to Antarctica: The White Continent: 12 days/11 nights aboard National Geographic Explorer. Rates begin at $12,350 AUD per person in a category 1 cabin based on double occupancy. Departures are Nov. 29; Dec. 9, 19, 29, 2014; Jan. 8, 18, 28; Feb. 7, 2015. Antarctica, South Georgia and The Falklands: 22 days/21 nights aboard National Geographic Explorer and National Geographic Orion. Rates begin at $20,720 AUD per person in a category 1 cabin based on double occupancy. Departures on the National Geographic Explorer: Nov. 9, 2014; Feb. 17, 2015; on the National Geographic Orion Dec. 27, 2014; Jan. 26 & Feb. 15, 2014. For more information on Lindblad Expeditions-National Geographic, or to book, visit www.expeditions.com, call 1800 EXPEDITION (1800 397 334) or see your travel agent.